Verbascum plants are biennial herbs, according to the United States Department of Agriculture (USDA), and are listed as noxious weeds in the states of Colorado and Hawaii. This tall (up to 6 feet), attractive plant is desirable in other states for its ease of care and showy, bright yellow flowers. Also called common mullein, verbascum plants are widespread throughout North America and thrive in USDA growing zones 4 through 8. Once established, verbascum requires only basic culture. Choose a sunny location for your verbascum. These plants thrive in full sunlight and bloom best when they receive at least six hours of sun exposure per day. Plant your verbascum in well-draining soil. Planting can be as easy as scattering seeds or digging a shallow trench for a seedling. The soil does not have to be amended with any compost. Second-year plants have long taproots and can thrive in most types of soil--including clay and rocky soil--but the plants do not fare well in soil that is very wet. 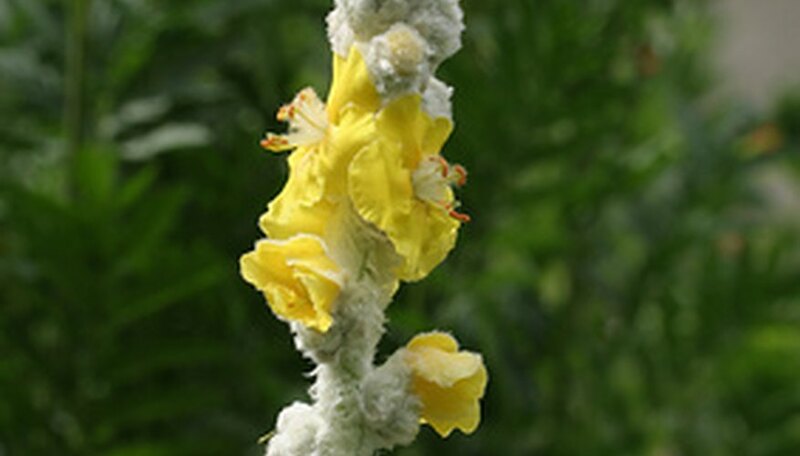 For these reasons, verbascum plants are a good choice for the drier areas of your landscape. Water newly planted verbascum plants well and keep the soil moist throughout the growing season. In the first year of life, these plants have shallow roots. Established and second-year plants are a different story, however, as they develop the long taproot during the second year of growth. Water your established or second-year verbascum sparingly. The plant thrives in dry soil and is drought-resistant. Water only during extended hot, dry periods. Cut back the tall stalks in the fall before they go to seed if you want to avoid the plant re-propagating itself. Birds love the seeds, however, so if you leave the stalks the birds might eat them before they can scatter. The flowers and leaves of the verbascum herb are sometimes used for various health purposes, including reducing chronic coughing and as a sedative. Verbascum plants do not need fertilizing. Avoid trying to transplant established verbascum, as the long taproot makes this very difficult to do. First-year verbascum plants have shallow roots, however, and can be easily transplanted.